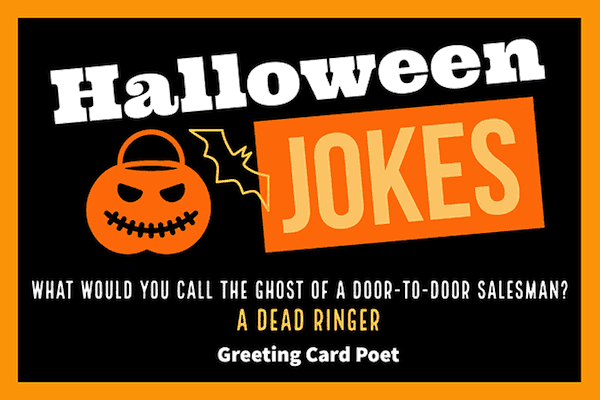 Halloween jokes appeal to monsters of all ages and with these, you can make all of your friends groan with these gems. All Hallows Eve is supposed to be fun and we’re here to make sure you have something to make all the little trick-or-treaters laugh, so check out this collection of funny jokes that you should have nothing to worry about sharing. Topics from our large list include ghosts, witches, vampires, skeletons, and more! 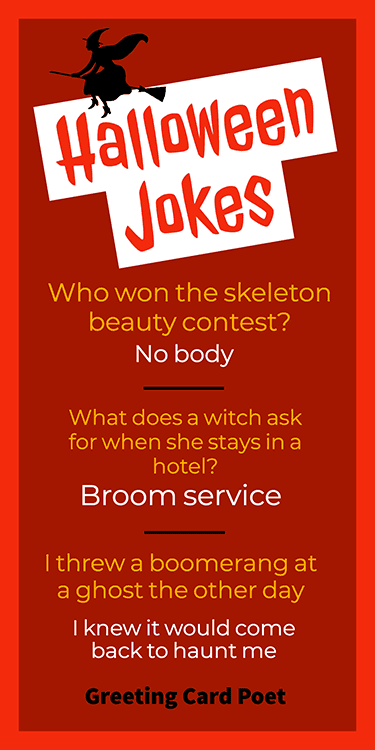 The jokes that we’ve compiled are sure to boo-st your enjoyment during the spookiest time of year. Beware… you’re entering the Halloween Jokes zone. Why can’t skeletons play church music? Because they don’t have any organs. Check out our Halloween Puns. Why do skeletons drink lots of milk? Because it’s good for the bones. Why did Dracula’s mother give him cough medicine? Because he was having a coffin fit. What did Dr. Frankenstein get when he put a goldfish brain in the body of his dog? I don’t know, but it is great at chasing submarines. Cause everyone was a goblin. What would you call the ghost of a door-to-door salesman? Learn about history, customs and greetings of Halloween. I threw a boomerang at a ghost the other day. I knew it would come back to haunt me. How do ghosts like their eggs? What do short-sighted ghosts wear? What’s a ghost’s favorite type of bird? In a dead end street. What kind of ghosts do you find at the top of sky scrapers? Why are ghosts bad at telling lies? How does a ghost say goodbye to a vampire? Why are the ghosts in graveyards so noisy? Because he didn’t have a haunting license. What kind of horses do ghosts ride? Why did the ghost go to the disco? Because he liked to boo-gie. What’s a ghost’s favorite day of the week? Who writes all the books about haunted houses? What do you get if you cross a vampire with a laptop? What’s a vampire’s favorite cocktail? Why did the vampire break up with her boyfriend? Because he wasn’t her type. I’m thinking of joining my local vampire club. Apparently they’re always looking for new blood. Did you hear about the vampire who tortured his victims with music? His Bach was worse than his bite. How do vampires travel across the sea? Why are vampire families always so close knit? Because blood is thicker than water. Why do vampires need cold medicine? Why did the witches’ team lose the baseball game? How does a witch know what time it is? She looks at her witch watch. How did the witch get around when her broomstick broke? How do witches get good bargains? Why do witches fly on broomsticks? Because vacuum cleaner cords aren’t long enough. Why don’t angry witches ride their brooms? They’re afraid of flying off the handle. What happened to the witch who was naughty at school? What does a witch ask for when she stays in a hotel? Who’s a witch’s favorite movie director? Why was the witch’s paper marked down? She didn’t spell check it. Why did the witch put her broom in the washing machine? Because she wanted a clean sweep. What do you get if you cross a witch with ice? What kind of jewelry do witches wear? Why is drinking witches brew good for you? What is the best advice a pumpkin pastry baker can give? What do you call a famous girl band? What do you call a Jack-o-lanterns family members? Who is the leader of all Jack-o-lanterns? How do you know a veggie is tough? Because it has thick pump-skin. What are Jack-o-lanterns afraid of? Things that go Pumpkin the night. How do Jack-o-lanterns get to so strong? Tip: These Halloween jokes make great captions for social media posts. What kind of alley does a ghost prefer to haunt? Why wasn’t the vampire working? What’s a ghosts favourite ride at the carnival? What is a vampires favourite type of ship? What musical instrument does a skeleton play? Because her baby was coffin. You’re on Halloween Jokes page.